It is shocking when one is injured in a slip and fall. One is simply going about their way in or outside a business when suddenly they find themselves injured on the ground. Such cases are often the result of one’s negligence and you should not be responsible for someone else’s failure to maintain their property. If you have fallen on a slippery surface and suffered injuries then contact Springfield Missouri Slip and Fall Accident Lawyer Tom Kapstrom today. We offer free initial case assessments. While it is impossible for any property owner to keep their premises one-hundred percent safe at all times, all businesses are required to use reasonable care in keeping their property safe. If a property owner neglects this duty, and injuries occur as a result, then the owner will be required to pay the victim’s medical bills, lost wages, as well as any pain and suffering. These types of matters are highly contested as they often revolve on whether the property owner knew of the dangerous condition and whether they were taking steps to correct it. The extent to which these cases are disputed make it imperative that you retain an attorney immediately. Slip and Fall Accident Lawyer Tom Kapstrom has extensive experience handling slip and fall cases. Once retained Tom will immediately make a demand to the property owner that all evidence relating to the case be preserved. He will work with your medical providers to obtain the needed records so he can make an immediate demand to the premises owner’s insurance company. Should the owner dispute liability then Tom will not hesitate to file a negligence complaint in the Circuit Court. He will then use the discovery process to establish the owner’s liability and help you get the compensation you deserve. Do not trust your injury to a lesser experienced attorney. Call our Southwest Missouri office today. Tom is a southwest Missouri injury lawyer who handles all matters in his office personally. This means that the highly disputed process of a slip and fall case will be handled by your attorney and not an office staff member. Tom’s personal handling of the matter will allow you to rest assured that everything in your case is flowing smoothly and efficiently. Additionally, he prides himself on providing a high level of service and stays in regular communication with his clients. Call our office today. 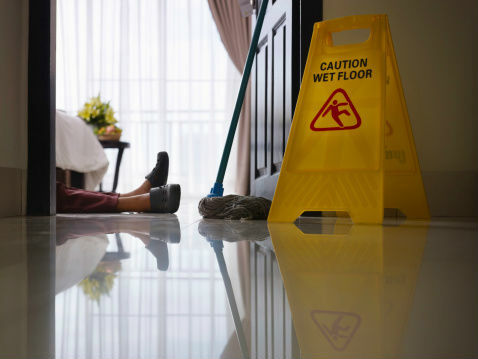 In addition to slip and fall cases, Tom handles matters involving workplace injuries, dog bites, property damage, and wrongful death.